Held to be the foremost representative of Fauvism, throughout his life Henri Émile Benoît Matisse excelled in painting, sculpture, graphic art and collage, and has gone down in history as one of the great figures in twentieth-century art. After obtaining a law degree in Paris, he worked as a solicitor at a law firm, but left in 1889 to study art under the painter Bouguereau at the Académie Julian. In 1893 he began to study under the Symbolist painter Gustave Moreau at the École des Beaux-Arts and joined his workshop in 1895. 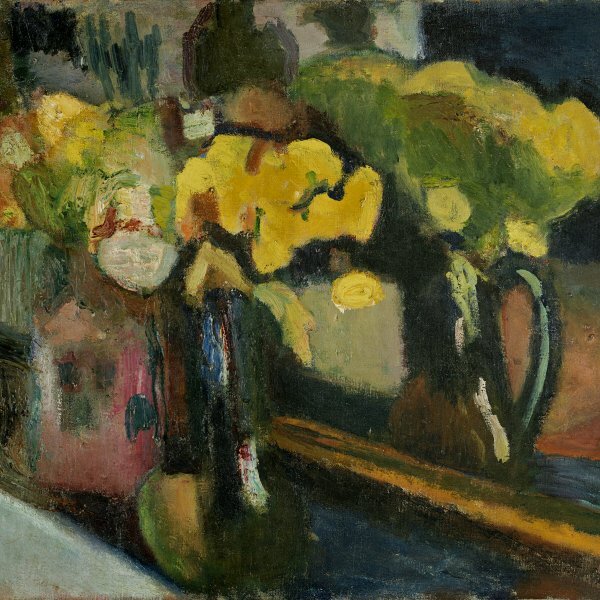 In addition to the influence of Moreau and the masters whose works he had copied at the Musée du Louvre, Matisse’s first works attest to an affinity with Impressionism. However, at the turn of the century, while working at Carrière’s workshop, Matisse came into contact with André Derain and through him with Maurice Vlaminck. Influenced by Post-Impressionist painters such as Paul Signac, Paul Cézanne, Paul Gauguin and Vincent van Gogh, his language developed towards a new subjective expression of reality based on the concept of colour freed from its descriptive function. The three artists exhibited at the Salon d’Automne of 1905, where the critic Louis Vauxcelles branded them as fauves (wild beasts), the name by which the group became known thereafter. These years were characterised by marked colour contrasts and the influence of African sculpture. In the 1920s Matisse’s work became infused with a serene sensuality and he turned his attention to tradition, with a greater presence of ornamental features. His artistic creed, which branched out into many media such as sculpture, lithography, ceramics and painting, was summed up in his Notes d’un peintre, published in 1908. Matisse’s fame progressively grew from the end of the first decade of the century and aroused increasing interest among collectors and dealers, notable among whom were Leo Stein and his sister Gertrude and the Russians Morosov and Shchukin, for whom he executed the Dance and Music panels (Saint Petersburg, The State Hermitage Museum) from 1909 to 1910. From the 1920s onwards Matisse lived between Paris and Nice and from 1943 in Saint-Paul de Vence, where he designed the decoration for the chapel of the Rosary (1948–51), one of his most important commissions. A serious illness left him practically paralysed in 1941, though this did not interrupt his activity; indeed, it led him to intensify his work on paper, particularly the papiers decoupés, which are notable for the modernity of their calligraphic schemes and purity of colour. The Matisse Museum was opened in his town of birth, Le Cateau-Cambrésis, in 1952.